The portable speaker is perfect for outdoor . .
6W Bluetooth Speaker the sound coming from the speaker is clear and natural. Feel the bass and the treble with a stereo that really plays the beat. With the built-in 2000mAh battery the portable speaker could work up to 5 hours and it needs only about 2 hours to charge. The wireless speaker could also charge for your mobile devices per USB output interface. Premium Sound with Bass Enhance: Powered by a high quality 10w (2*5W) audio driver. Beyond traditional design, this speaker is unique and with great sound quality. Perfect for in home, on vacation, camping, or put it to your backpack to play your favorite music., .Support TF card, USB, FM Radio, Line in, High sensitivity FM radio. High capacity rechargeable 2000mAh battery for up to 5-12 hours playtime on full charge. give you longlasting music enjoy. and enjoy hands-free calling and support telephone number reporting .more convenience for your life! Support music formats: MP3, WMA,WAV, FLAC , It can connect to most of bluetooth-enabled devices via up to 15 meters distance advanced built-in 2.1 bluetooth for music enjoying. and connect to non-bluetooth devices with supplied universal AUX cable. 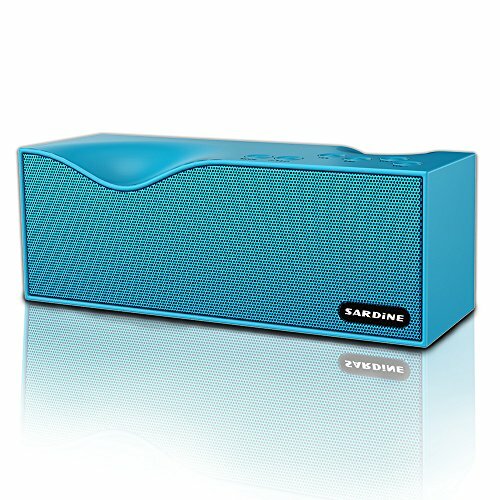 What you get: 1xSARDiNE bluetooth speaker, 1xUSB cable,1xAudio line,1xUser manual,Giftbox, and our professional after-sales team 1 year warranty and friendly customer service.